In North Laos, some farmers located near big towns are moving from traditional ways of keeping pigs, to market-oriented systems to meet growing demand for pig meat. However, these farmers are faced with slow pig growth due to poor quality of feeds. We are well aware of the impact of improved nutrition on livestock – a good example is the project we highlight in Cambodia with our video on an ACIAR/UNE forages project. The Crawford Fund supported a training course for provincial and district livestock extension workers aimed at helping pig farmers to improve productivity. 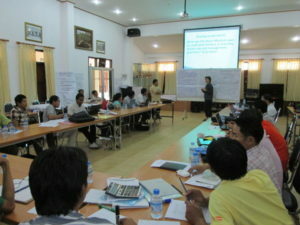 The course covered aspects of nutrition and management specific to smallholder pig production systems. 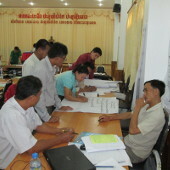 It was attended by 19 extension officers, 3 livestock researchers, 2 extension researchers and one farmer. During the course, researchers from Livestock Research Center (LRC) presented results of research on local pig nutrient requirement and nutrition, and ways to improve smallholder pig production. Participants looked at different local available feeds and learned about their energy and protein values. They then learned how to prepare specific combinations for pigs in different growth stages. Pig health problems, treatments and housing management were also covered. Extension specialists discussed the best methods for working with farmers, and how to evaluate production and livelihood impacts from practice change. “Most participants are working directly with farmers and appeared keen to put into practice what they had learnt so we anticipate that on-ground impacts will be direct and significant,” said one of the trainers Dr Phonepaseuth Phengsavanh. For those readers with a particular interest in this topic, you may care to read about an ACIAR project on improved breeds, feeds and disease management of pigs in Laos.